CHOISIR (AUS) (Chestnut 1999-Stud 2003). 7 wins-3 at 2, VRC Lightning S., Gr.1. Sire of 1344 rnrs, 856 wnrs, 71 SW, inc. Olympic Glory (Longchamp Prix Jean-Luc Lagardere, Gr.1), Starspangledbanner, Obviously, Sacred Choice, Historian, Choice Bro, Japonisme, Kushadasi, Sir Moments, Dreamscape, Hurried Choice, Glory Awaits, Celtic Dancer, Stimulation, Chandlery, Champagne Harmony, Gold Water, Incumbent, Big Money, Eloping, Monsieur Joe, etc. Hot Goods (f. by Time Thief). 5 wins-1 at 2-at 1000m, A$248,550, to 2015-16, WATC Westspeed 3YO P.-3 times, Myer Fashion on the Field S.
Circle of Friends (c. by Danasinga). Placed at 2, 2d WATC Del Basso Smallgoods Nursery H.
Moet Dancer. 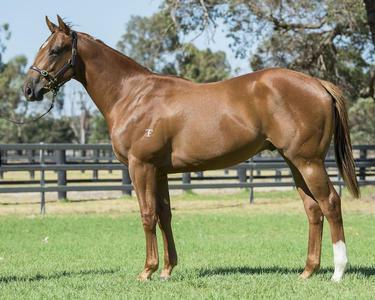 3 wins from 1600m to 2200m to 2014-15, WATC Become a Member Today H., 2d WATC Festival of Perth Racing H.
Arrian. 5 wins to 1400m, WATC Toohey's Extra Dry H., 2d WATC November Rain H., Swan's Pride H., 3d WATC Santa Brae H., Chinese Arithmetic H.
Golden Act. 3 wins. See above. Competitor. 6 wins from 1100m to 1750m, 3d WATC Premiership Flag H., Runyon H.
Catwalk Island. Winner at 1000m, 2d TRC Kevin Sharkie H., Grand Final H.
General Albert (Magic Albert). 6 wins-1 at 2-to 1500m, A$262,361, BTC XXXX Gold H., MRC Cardinia 2YO H., MVRC Rohan Smith H., WATC Myer Fashions on the Field H., Winter Championship Qualifying Heat H., 2d VRC Debonair S., Gr.3, WATC Track on Track National Apprentices' Challenge H., 3d WATC Perthracing.com.au H.
Glasos. 3 wins at 1000m, 1100m, A$117,050, STC MJ Seymour & Co H., Rutherford H.
Smartlord. 3 wins-1 at 2-from 1000m to 1600m, HK$3,359,000, HKJC Chongqing H., Peninsula Golden Jubilee Challenge Cup, 2d HKJC Beas River H., Foshan H., Austin H., 3d HKJC Chinese Recreation Club Challenge Cup. SABIE (Exceed and Excel). 3 wins at 2, A$93,688, SAJC Pewsey Vale S., L, MVRC Black Caviar at MV 27 January 2YO H., 2d SAJC Adelaide Galvanising H., 3d MRC Blue Diamond Preview (f), L, SAJC One Solution Mobile & Data H.
Ankaret (Desert Prince). 5 wins-2 at 2-to 1400m, A$190,100, AJC Leger 2YO H., MRC Harrolds Fashion P., Baryshnikov H., STC Cup Day at Rosehill Gardens Welter H., MRC Bill Duncan 2YO H., 2d VRC Australian Cup Carnival S., L.
Graskop (Manton). Winner at 2, A$93,378, MRC Premier Signs 2YO P., 2d VRC Better Beyond 2YO P., MRC Champagne Pommery P., 3d MRC Blue Diamond Preview (f), L, VRC Ken Cox 2YO H., MVRC Echuca Workers & Services Club 2YO H.
Thwayya (Snitzel). 2 wins at 2 in 2014-15, ARC Celebrating Durham Town 2YO S., 3d Waikato RC Star Way S., L.
Conquista. Winner at 2, WATC Star System 2YO H., 2d WATC Originial Sin 2YO H.